Here we are back into it again feeling much fitter after our spell. Winter is coming on us here and we are having fairly cold nights with winds but little rain. 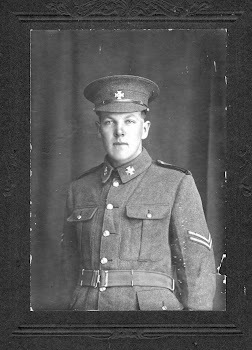 Except when we are in the trenches at night the cold will not trouble us much as we have very comfortable dugouts to live in and are well supplied as to food and clothing for the winter. From our gun posse we have a fine fiew of the country towards Suvla Bay from Anafarta on the right to the island of Samothrace which lies out at sea benind us. The gun I am on at present is only mounted at night otherwise the Turks would spot us and shell us out of it, so that I have time to do a bit of writing in the day time. I don't know whether you have ever received a letter that was written under fire before. This one was, at any rate the first part of it. I am sitting down on the bottom of the gun pit Jacko is putting over shrapnell and bursting it round about us we get the smoke blown down to us. It has a peculiar resiny smell. 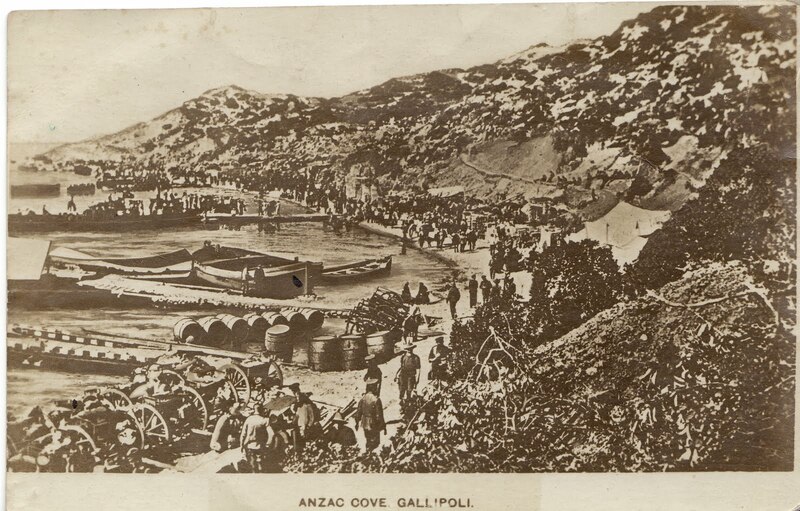 If I ever get through this the smell of burning resin will always recall the bombs and shells of Gallipoli to me. I am finishing this in our bivy. There is not much I can write of. From here too we get a great view, we look towards the sea and have all the country towards Suvla Bay at our feet. The hill we are on is variously known as [censored] we are about 3/4 way to the top our top trench is known as the Apex we are a little to the left on "Cheshire Ridge" and have a good view of the shipping the beach etc. 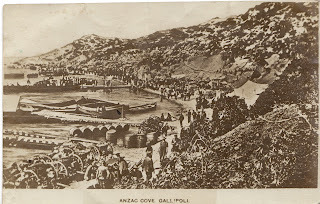 I would guess that the cove was only named 'Anzac' after the war? so in that case it was added in later? I always imagine the scene as so barren; guns aside it could be an early settlers landing point or beach arrivals heading to the gold rush.